Not All Those Who Wander Are Lost: I am blessed . . . .
. . . . to still have some old fashioned playing marbles and a nice fishbowl, with a little crack in it so that it can no longer hold fish, but makes a lovely marble container. Some folks would call this recycling. When I was growing up it was called making the most of what you had, and waste not, want not. It's certainly a far cry from our modern 'throw away' society. Now how did I get off on that track? I only meant to show you all that when I'm feeling better, I have the marbles and can go play in the spring mud too. Dawn I am so glad that you are feeling better now! PS...I have my old marbles in an old ball jar, and have encouraged my son to save his old marbles in his old cigar box....my husband lost his marbles a long time ago (heh, heh)...anyway ....I challenge you to a game in the spring mud, winner gets to keep the opponents shooter! Not better yet Cyndy. Still fighting the battle and heading into the third week of it. No energy for playing in the mud right now . . . maybe later. Those marbles you see in that picture are the ones I'll take up your challenge with. 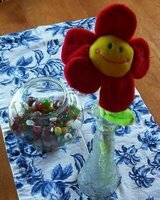 I purchased them at local secondhand stores, but we do have other marbles that belonged to special people and can't risk losing them. 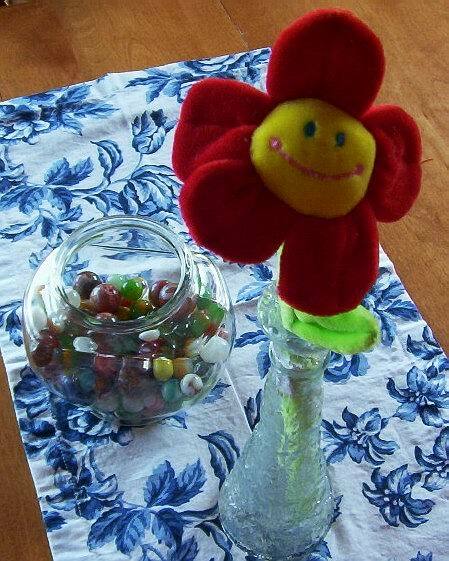 Marbles in a glass container are wonderful! I have some big ones in with the fish in his big brandy snifter! We have some marbles in with our Bettas too . . . . and the odd seashell from off our local beaches.